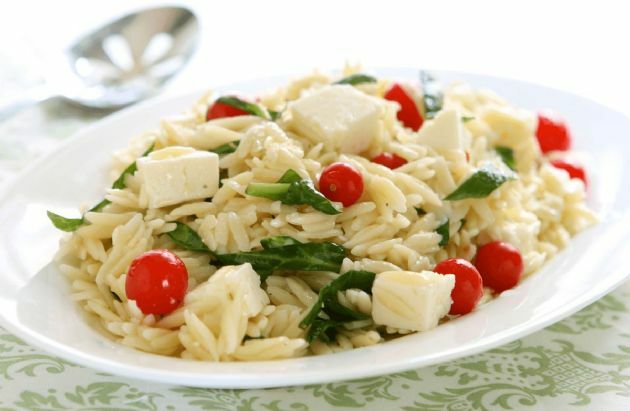 Most pasta salads are heavy on the pasta and light on everything else. This version, which can be served warm or cold, includes a hefty portion of vegetables--both spinach and tomatoes. Most pasta salads are heavy on the pasta and light on everything else. This version, which can be served warm or cold, includes a hefty portion of vegetables--both spinach and tomatoes. Chef Meg took inspiration from several different recipes to create a pasta salad that's heavy on the vegetables. She also added a full serving of cheese for protein! Swap feta for a low-sodium cheese if you are watching salt intake. Cook pasta according to package directions until it is al dente (firm to bite). While the pasta is cooking, place spinach, feta, and capers in a large bowl. Before draining pasta, add 1/4 cup of the pasta cooking liquid to the mixture; toss to combine. Place the tomatoes in the bottom of a colander. Once pasta is cooked, drain it over the tomatoes for a quick blanch. Toss tomatoes and pasta with the spinach mixture. Season with black pepper and garnish with shredded cheese.